Daily Illuminator: Looking Backward. Forward. Again. Whatever. February 15, 2010: Looking Backward. Forward. Again. Whatever. All this time travel is getting confusing. Okay, so last week I wrote a bit about about the new Transhuman Space PDFs we'd recently put up. Well, this week I have to do that very same thing. We just released Transhuman Space Classic: Fifth Wave and Transhuman Space: Teralogos News - 2101, First Quarter, you see. But what am I supposed to write? History is clearly repeating itself. So not only am I talking about the future that's from the past, but now I'm doing it for the second time. If our release schedule keeps this sort of thing up, I'm going to have call Geordi in to fix it. Perhaps it's best to keep it simple, then. Come get some cool Transhuman Space stuff! 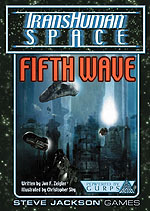 Fifth Wave is a cool reprint and Teralogos News is free! And don't ask too many questions or you'll rip a hole in space-time!